Hey guys, I am looking for some fellow gamers on the Wii U to play DI with from time to time. I have the speedway and also can download any toy box, plus I will be getting the battlegrounds on Tuesday when it releases. Also, I have two kids who play on separate accounts, but will gladly add their NNIDs if there are some other kids out there that want to play. A 9 and 7 year old, and then me, the 34 year old DI fanatic. Hey, I play on Wii U! 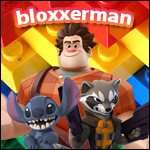 My NNID is bloxxerman!